I’ve mentioned before my extreme love for VOD. It’s the best thing since sliced bread I tell ya! I’ve been waiting for the perfect time to try to influence you to give this “on demand” thing a shot and now I have the perfect reason. Remember when my friend Leslie did a guest post on the movie she co-produced, Favor? No? Well then you should probably go read it before continuing on (click here). Now that you are up to speed we can continue. Favor has done very well on the festival circuit but that audience is limited to those who … well … go to festivals. Let’s face it that’s probably not you (and me). Team Favor has worked very hard to make it so their movie is available to the masses (aka you and me). According to the picture I stole from Favor‘s Facebook page it is now available on every VOD platform that exists. Most folks tend to flock toward iTunes. Favor is doing very well there and even I, in my odd anti-iTunes ways, could easily find it on the TOP MOVIE CHARTS. That’s right. My friend’s movie is right there at #48 (as of right this minute) tucked nice and cozy between Labor Day and Bad Country. It’s my understanding it is much higher in the genre specific charts but I didn’t look. I trust the Favor folks and didn’t feel the need to verify it. For my VOD viewing I almost exclusively use Time Warner Cable. Mostly because it is available on my TV. All the VOD (or almost all) have the ability to stream to your TV but require a box or stick or subscription or whatever. TWC is my cable provider so is already on my TV ready to take advantage of my need for instant gratification. Luckily for me Favor is available there. Along with TONS OF TV SHOWS AND OTHER MOVIES. It’s were I watch the shows that don’t make the DVD list for space reasons. All those Discovery, Syfy, and USA shows. It’s so wonderful. Not to mention they have every children’s show known to man. When my niece and nephew come over I don’t have to worry about what is available for them. I turn on the on demand and we are good to go! Any TV shows that you normally get with your cable subscription are free on demand. Most movies and special events have a charge that goes directly on your next cable bill. My second favorite place to watch shows on demand is Amazon. 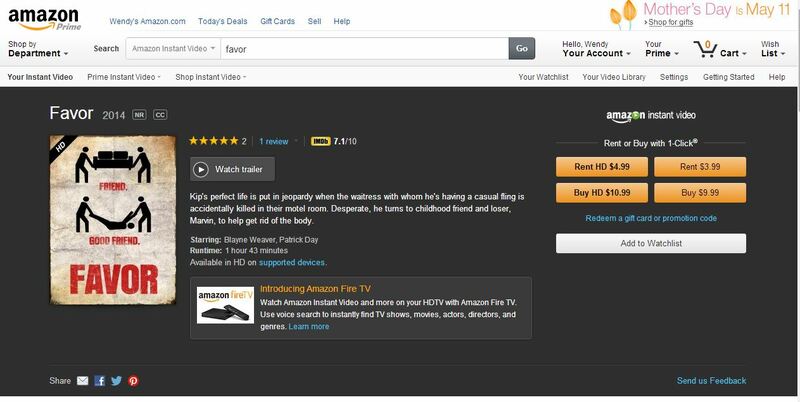 Many people don’t know that you can stream movies/tv shows from Amazon. Well you can! They even have Amazon Fire TV which allows you to stream directly to your TV (they also have a brilliant ad campaign using Gary Busey that makes me giggle every single time I see it). If you are a prime member many shows are free. That’s right … FREE! It’s how I got caught up on Downton Abbey. Something I highly suggest you do as well. Amazon recently made trade news by inking an exclusive deal with HBO. Now I’m assuming those shows aren’t free but starting May 21st HBO owned content will be available through Amazon Instant Video! 1. TV On Demand – On demand has already focused your audience to folks that REALLY want to be watching a specific show. Unlike DVD’d TV most “on demand” network options through cable providers don’t allow fast forwarding. Personally as a viewer this kinda pisses me off but it is the ONLY time I watch commercial breaks all the way through. Just be careful when placing ads in on demand as you need to be aware that these shows can be watched at any time so any spot that is time sensitive doesn’t work well there. Also showing the same ad over and over each break makes a viewer want to hit you not purchase your product. 2. Podcast Live Reads – There are a few very highly rated podcasts that are well worth advertising on. Once again you can do a good job of targeting a very engaged consumer. You are also asking someone who they adore or look up to, to be part of your ad. Many podcasters (or ex-radio folks) are very good at live reads. If they are let them do it. They know how to speak to their audience and if their audience is loyal they will do what they are told. I don’t like Howard Stern but I’ll give him this much … he was king of the live read. Move your radio dollars to podcasts. That’s where you will find the new Howard Stern like audience. Ok enough of my preaching … get to watching Favor!